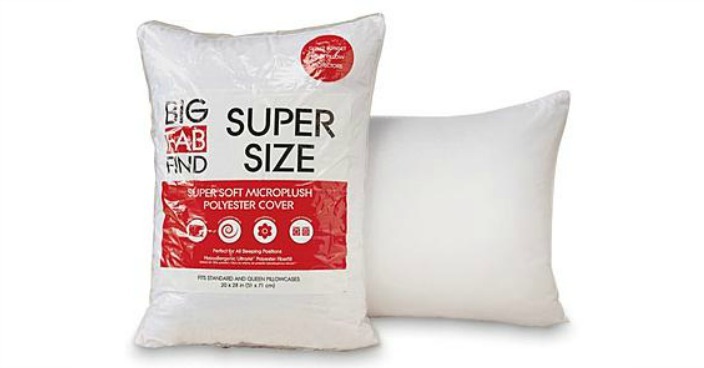 Big Fab Find Supersize Jumbo Fiber Pillow Just $4.99! Down From $10! You are here: Home / Great Deals / Big Fab Find Supersize Jumbo Fiber Pillow Just $4.99! Down From $10! Sears has this Big Fab Find Supersize Jumbo Fiber Pillow on sale for just $4.99 (Reg. $10)! Plus you can get FREE in-store pickup or FREE shipping on orders over $49! No matter how good your mattress is, you need great pillows to complete your bed ensemble and the Supersize Jumbo Fiber Pillow will meet all your bedding needs. The oversized pillow is filled with long-lasting fiberfill that won’t get lumpy or hard with repeated use and guarantees night after night of sleeping bliss. It’s the perfect pillow for all your family beds as well as the ideal pillow to stow in the closet for relaxing on the sofa or taking along on car trips for kids to snuggle up to in the backseat. Guests will appreciate finding a perfect pillow in their bed at the end of the day.